The therapy stimulates the part of the brain that controls planning, problem-solving, and judgment. Doctors at the Ohio State University Wexner Medical Center are experimenting with an implanted “pacemaking” device in Alzheimer’s patients to help them retain independence. The device allows the patient to undergo Deep Brain Stimulation therapy. 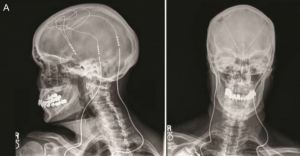 This therapy involves implanting electric wires deep into a patient’s brain and connecting them to a battery pack implanted in the chest. The pack sends electric currents through the wires to stimulate the part of the brain that controls the abilities to plan, problem-solve, and use judgment. The therapy is already in use by hundreds of thousands of patients living with Parkinson’s disease to help overcome tremors. The use of Deep Brain Stimulation to treat Alzheimer’s is still in the experimental stage. While previous studies have focused on stimulating the brain regions governing memory, this new study moves the focus area. The Ohio State tests have shown positive results in all three of the patients in the pilot study, and the progression of the disease significantly slowed in two patients, according to a paper published in the Journal of Alzheimer’s Disease. By turning back on parts of the brain, the two patients could be able to retain quality of life longer than those not undergoing the therapy. While it may not be able to defeat the disease itself, Deep Brain Stimulation seems to have the potential to provide patients and their families some welcome, immediate relief. However, the science behind the therapy’s effectiveness for Alzheimer’s is still developing. Andres Lozano of the University of Toronto is also undertaking studies to test the therapy’s effectiveness with Alzheimer’s patients. Lozano stressed in an interview with the BCC that the treatment is not meant to cure the disease, and it does not cease cognitive decline altogether. Researchers around the world are painstakingly working to better understand Alzheimer’s to fuel future breakthroughs in treatment. To that end, Microsoft co-founder Bill Gates announced a $100 million initiative late last year to help defeat the debilitating disease along with other forms of dementia. Part of this initiative will focus on easier and faster diagnoses to treat the disease earlier. A promising new blood test being studied in Japan could increase the time doctors have to treat the disease by up to three decades. Not only could early detection let doctors form better treatment plans, but it could also help researchers learn more about how the disease progresses over this long period of time, giving greater insight into its development. Other researchers are working on treatments that could potentially delay or even prevent the disease from developing. Scientists from the Washington University School of Medicine in St. Louis, Mo, are targeting a specific gene variant that increases the risk of developing the disease by a factor of 12. Human trials are also underway for two preventative measures that could also prevent the disease from ever developing. Researchers from the University of Southern California (USC) Keck School of Medicine are testing an oral medication as well as a vaccine that target the proteins which build up in the brains of disease sufferers. However, all of these procedures are still under investigation. Deep Brain Stimulation therapies could be a very welcome addition to treat the symptoms of the disease while researchers work on ending the disease once and for all. Allowing patients to retain greater levels of independence is a fantastic step forward and will buy families more time as the researchers continue their important work.